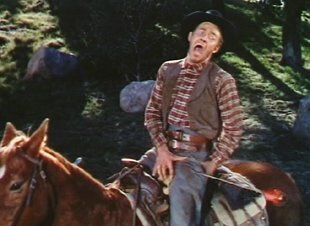 I've always liked westerns, but I'm becoming a western junkie. 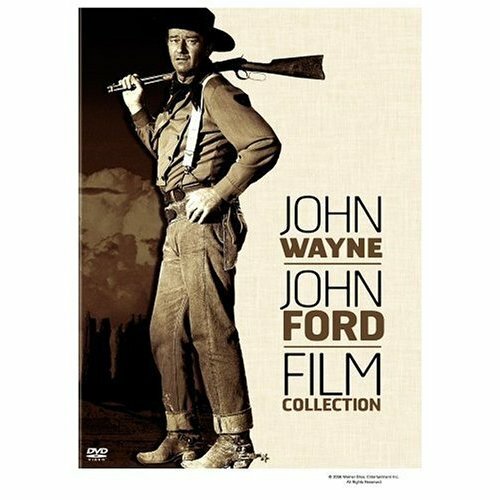 I've been lapping up all the John Ford/John Wayne classics lately. Chana bought the collection for me for Father's Day. I had picked up "The Magnificent Seven", a John Sturges film, a few months ago, and that kicked off my renewed craze. Steve McQueen is one of the stars of "The Magnificent Seven", and I thought I'd check out some of his other acclaimed work. 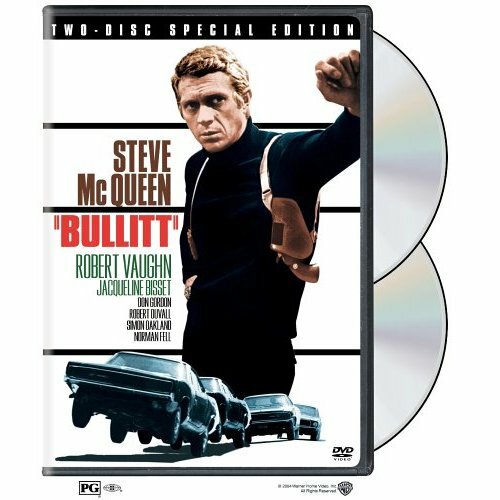 "Bullitt" has become a favorite. It is the film with the famous car chase through San Francisco. Chana and I watched the car chase again last night, and I marveled how the scene was riveting through and through, and not ONE special effect was used. Just juicy car footage and gutsy editing. Another fun part of "Bullitt" is that the style is very reminiscent of Soderbergh's "Ocean's 11". (haven't seen "12") The music, the graphic opening title stylings and a few other factors of "Bullitt" reminded me so much of "Ocean's 11". It made me wonder if Soderbergh studied "Bullitt" and other films of that era to capture the feel of them for his film. Time off from Warner Bros means I'm trying to use my time wisely and hone some picture editing skills. It's been a treat to actually have some time to invest in cutting picture. I'm actually doing a few projects right now (for pay even!). I've always wanted to cut picture on a regular basis. Well, at the moment I'm definitely getting my chance to focus on it totally. 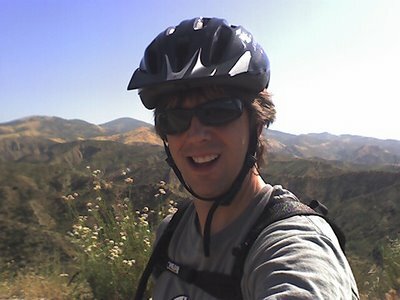 I don't usually deviate far from the "industry" stuff I usually post about, but since I've listed my mountain bike as one of my interests in my profile, I thought it was worth a blog or two. If this doesn't interest you, please let your mind wander, and I will be back soon with more from the world of movies/sound/drumming and other things creative in no time. I'm out of my usual work routine at the moment, which means I'm not going into WB everyday, and I'm working from home for a bit. My previous routine had me going to 24 Hr Fitness about 3-4 times a week and jogging or biking on machines; not as fun aesthetically, but it gets the job done in keeping me in top condition, er, well... able to climb stairs without doubling over and heaving mightily. So... I've been hitting the awesome local hills again on my mountain bike, and I am being reminded that there's nothing like being aboard the real thing. No exercise bike can give you a rush while riding it, no matter how fast you pedal. I'm thankful that I have this opportunity to ride here. These hills are about 1.5 miles from my house. Ahhh, California. 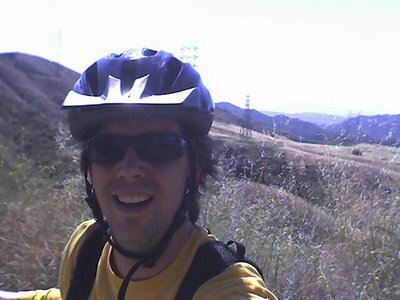 My first day back, I was only able to get about halfway up the evil mountain I like to climb (Due to my work schedule, I've been completely out of the exercise routine for about 3 weeks now - excuse me, ...urp...) The above pic was taken just before I descended. Today, I rode quite a bit higher. Not to the top yet, but I'm getting close. My goal is to do the ride without stopping at all. This would actually make things easier as it's almost impossible to get going again on steep climbs. I think I have a week or two to go to reach that level of endurance though. For now, I'll just keep trying to get better with each ride - and keep an eye out for snakes. Above is a screen-shot from my Pro Tools sound effects pre-mix session for an independent feature called RSTC. The final mix for RSTC was last week. Look for it soon on DVD everywhere; it's a lot of fun. From time to time I have friends, even family members, ask what I do. I tell them, "I'm a sound designer and sound editor for film and TV", and they say "oh, cool." Then more times than not, they follow up with the question "so WHAT do you do?" The nomenclature of my job, like almost any industry, is specific and confusing at times. For instance, ADR stands for "Automated Dialogue Replacement". Anyone who knows how ADR works knows that there ain't nuthin' automatic about it. ADR is the process of bringing in an actor to replace a line of dialogue for a movie when the original location sound is unusable. The actor watches the scene on a video monitor, hears three beeps leading up to the line, then reads the line in sync (hopefully) with the shot on screen. 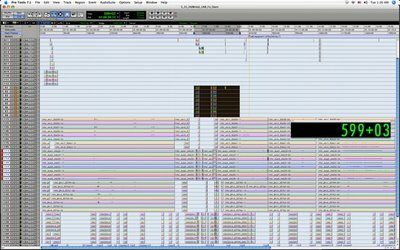 This new recording usually must be finessed by a dialogue editor to tighten sync and be prepared for the final mix. There's a lot of set-up time involved as well as post-time. Automated? Yeah, right. 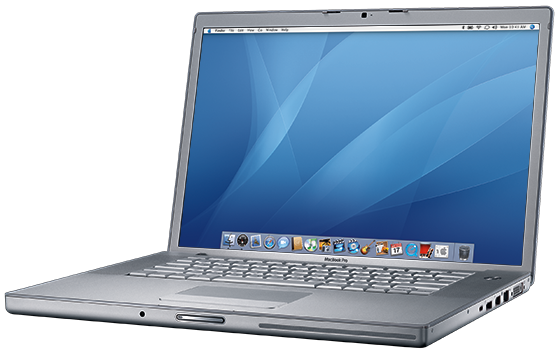 There are many processes involved in creating a soundtrack for a TV show or movie. My favorite is the sound design stage. 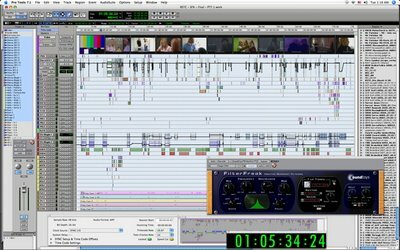 You can read about the many different aspects of audio post production here at the MPSE website. There are also some good FAQ's. Above is a screen-shot from my reconformed fx-stem session for reel 1 of the movie Hoodwinked. There were last-minute picture changes, so I reconformed (reconforming is resyncing existing sound files with new picture and filling in all the inevitable gaps in the tracks) all of the previously rerecorded tracks from April/May 2004, added more effects where we needed them, then delivered approximately 50 reconformed sessions to Skywalker Sound for the final rerecording sessions in October 2005. It was the most complicated "fix" I've ever wrapped my head around. And finally, this is a picture of a sound design suite at Skywalker Sound in the Tech Building. It belonged to Gary Rydstrom (Jurassic Park, T2, The Titanic) for many gigantic movie making years. You can see his synclavier on the console. 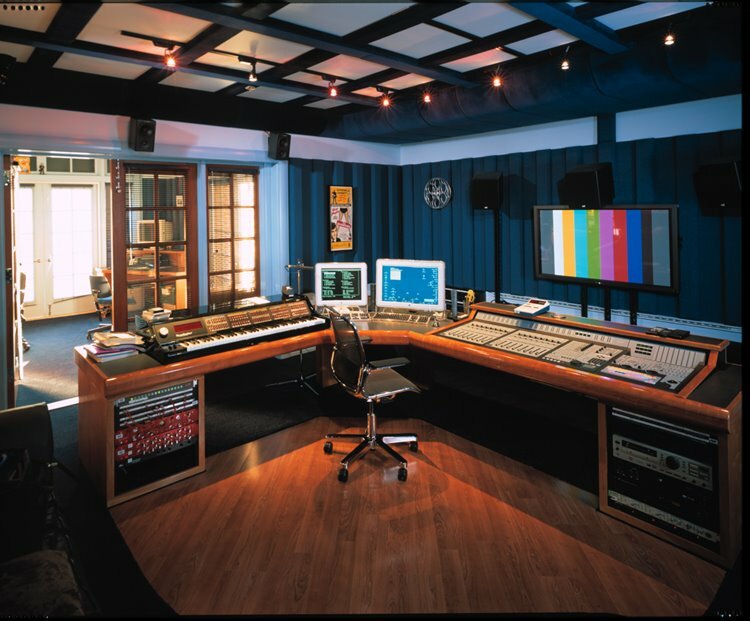 Chris Boyes (Lord of the Rings, King Kong, Titanic) has worked here, and Randy Thom (The Incredibles, Cast Away, Star Wars: The Return of the Jedi) now calls this suite home. Photo courtesy of custom-consoles. 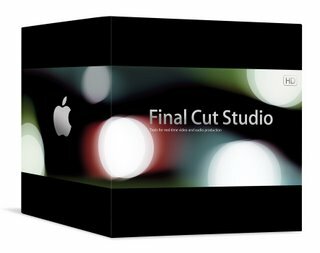 I'm about to let you in on a fun- yet sacred - sound editor tool. It's called the Wilhelm Scream. Basically, it's a distinct sounding scream, and if you've seen ANY adventure-type movies in the last 30 years, you've heard it multiple times. SInce then the scream has made it's way to several features, largely thanks to Ben Burtt. He has faithfully used the scream in all of the Star Wars movies, the Indiana Jones movies, and many more. Many other sound editors have used the scream as well. Ben Burtt has declared that he has finished his Wilhelm use and will let it rest. To hear this most excellent scream, click HERE. For a comprehensive history on the Wilhelm, click HERE. And here is a pretty thorough list of the movies the scream has been used in. A lot of this info was stolen from Steve Lee and his Wilhelm page. 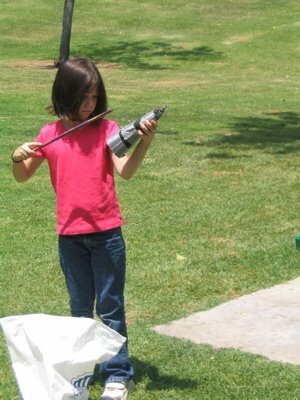 This past Friday, the kids had a homeschool park day with an accompanying "Show and Tell". McKenna (8) and Sky (6) were excited, but McKenna was looking for an idea. I suggested that she take some of my hand percussion and talk about some of it as she played it for them. She couldn't think of anything better, so she finally agreed. I pulled out my big bag of percussion toys and started showing her the techniques behind each instrument in it. She picked up the basics really fast and soon picked out her favorites for the Show and Tell. She chose the claves, triangle and cowbell. I was pleased that she chose the cowbell, because I knew she could have fun with the ever popular Christopher Walken character Bruce Dickinson's statement "I have a fever, and the only prescription is more cowbell." I taught it to her, she got it down, and everytime she practiced the line, I shot both fists straight into the air in fatherly triumph. Well, when the time came, she did her turn, said the joke, and no one knew the reference! 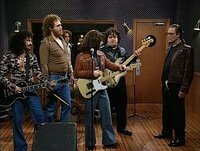 Now, what kind of society are we living in that 5-12 year-olds don't know a really funny reference from probably the best SNL skit in the last 20 years!! Okay, my kids didn't know it either, and McKenna did it SOLELY to make her Dad happy - but hey, still! 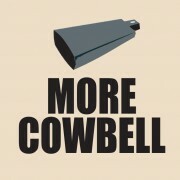 This is why I want to devote a little space to the cowbell here. And here's McKenna crankin' it up on a large cowbell. Whether they knew it or not, everyone left the park with a 98.6 that day. I just finished doing sound design on a pilot for WB Animation called Plastic Man. 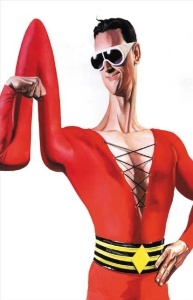 The original Plastic Man was created by Jack Cole, and is owned by DC Comics. The 10 minute segment was directed, produced and co-written by Andy Suriano. He's got serious artistic chops, plus the perfect wit for modern cartoons. I worked with him on another "pitch" a few years back, and this time was another great experience. We seem to think alike when it comes to sound effects. Andy has been an artist and designer for such shows as Samurai Jack, Star Wars: Clone Wars, Powerpuff Girls and The Fairly Oddparents. The whole team for this short was really good and there seemed to be good chemistry. Tom Kenny, the man who voices Spongebob Squarepants, is also a producer and co-writer on this project. He also lends the voice for our hero, Plastic Man. I've met Tom before, but never had the chance to work with him this closely. 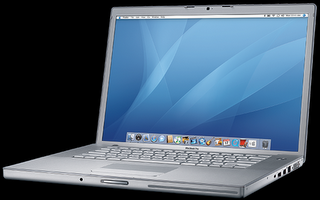 He's a lot of fun (big stretch, huh) to work with, and he's got a great sensibility for sound. We mixed it last Friday, and I'm pretty sure that I set a new personal record for the amount of SFX contained in 10 minutes. This thing is thick! The SFX were wall to wall; the music was wall to wall. Luckily, the dialogue still cuts through! A highlight for the family: At the end of the mix, Tom agreed to leave a message as Spongebob on my home phone recorder for the kids. They flipped out hearing Spongebob say each of their names, and he told them to have a "Sponge-o-riffic Square-tastic Memorial Day!"